The native peptide AAKIQASFRGHMARKK (27173) is a synthetic PKC substrate derived from the sequence of neurogranin, a naturally occurring PKC substrate. 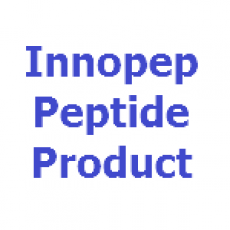 The peptide is proven to be a PKC substrate with quite good specificity. It is phosphorylated by purified PKC with a Km of 150 nM. No significant phosphorylation of the peptide by either PKA or by CaMK 2 is reported. Substituting Arg36 with Ile causes a significant reduction in the affinity for PKC. Replacing Lys30 with Arg enhances the catalytic efficiency (Vmax/Km) for PKC but diminishes the selectivity of the substrate for PKC. It is generally considered that basic amino acids on both sides of the phosphorylated Ser are important structural determinants in PKC substrates. In addition, the presence of particular basic amino acids (Arg vs Lys) may also contribute to the degree of selectivity of a substrate for PKC. Ref: Chang, DK. et al. Biophys. J. 72, 554 (1997); Chen, SJ. et al. Biochem. 32, 1032 (1993).